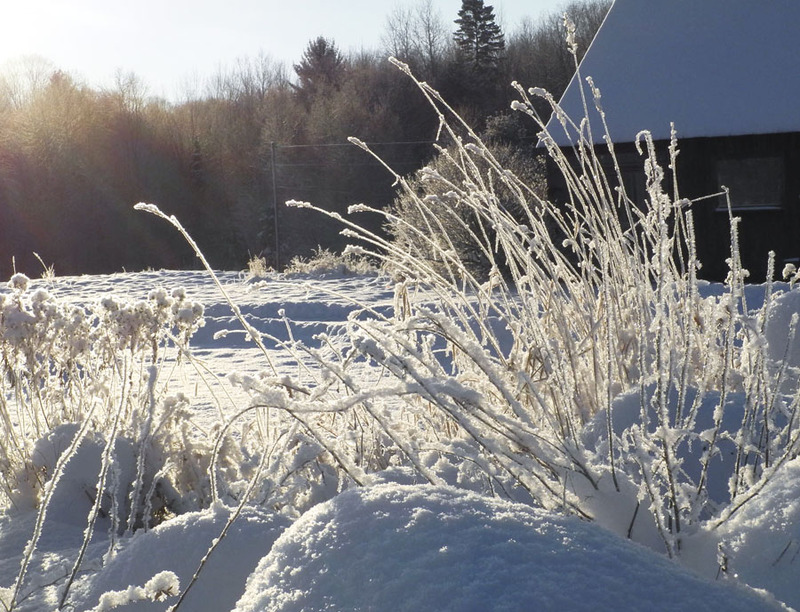 The loveliest of winter weather phenomena is hoarfrost, which turns the early morning landscape into a sparkling vision, with icy crystals coating the finest of surfaces. 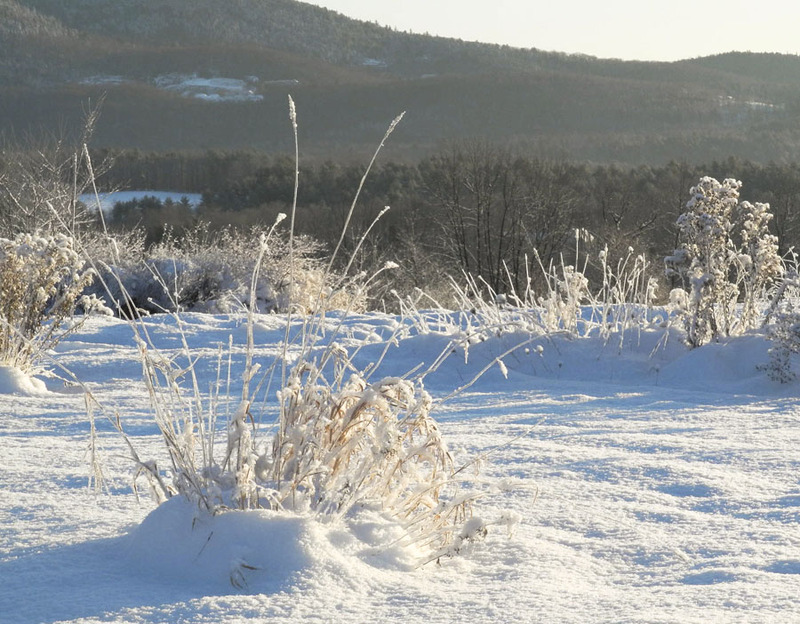 It doesn't occur often, and when it does it's magical; this morning it invited me to bundle up for the 6ºF weather, grab my camera, and go outdoors to photograph. 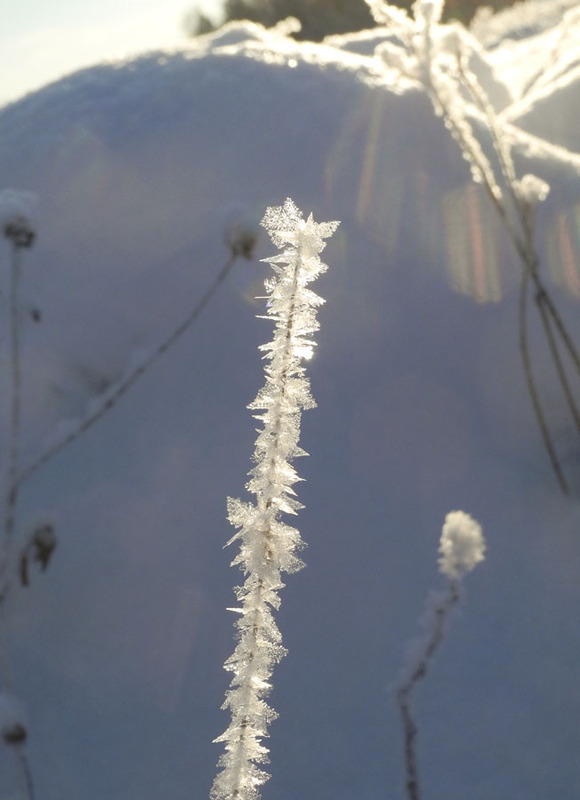 A single stem of a grass is bristling with ice crystals, each of the angled surfaces catching light. 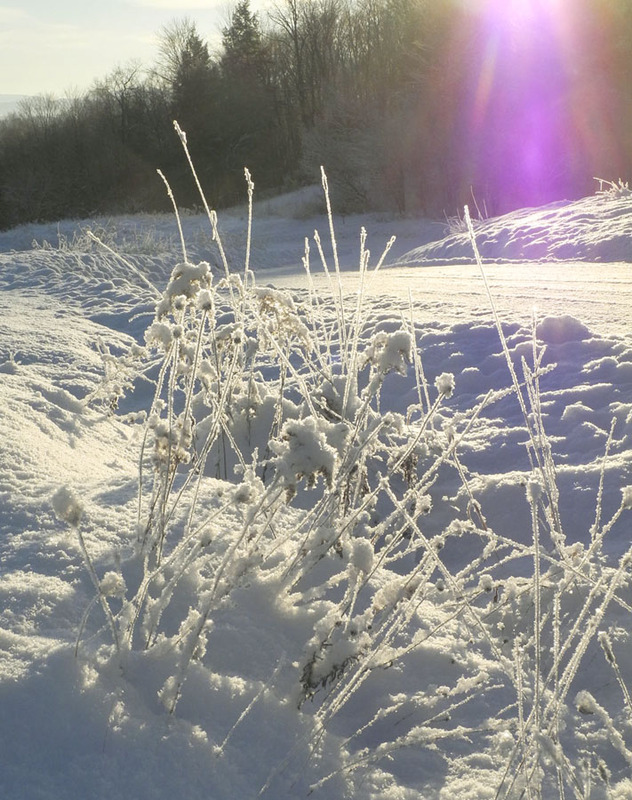 Instead of the usual golden weeds and grasses, there are shards of light against the darks of distant hillsides. 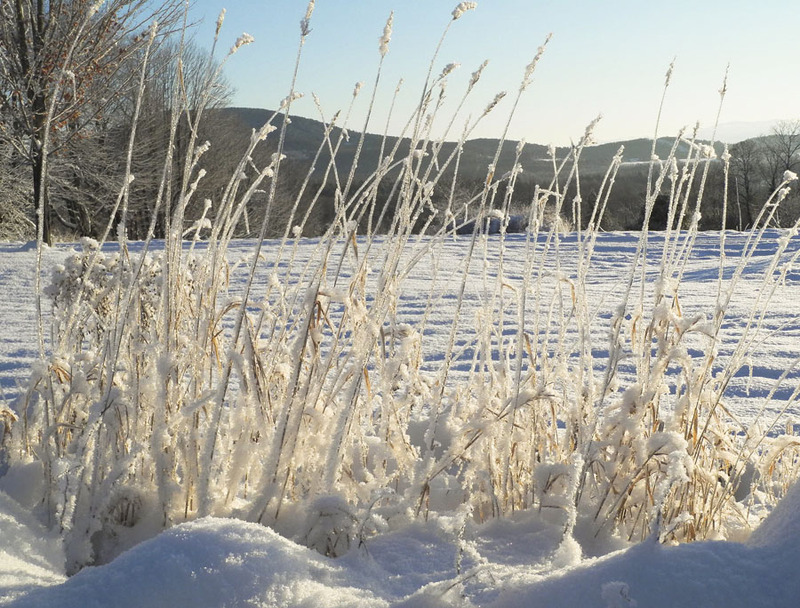 ....and grasses are transformed into a symphony of light. 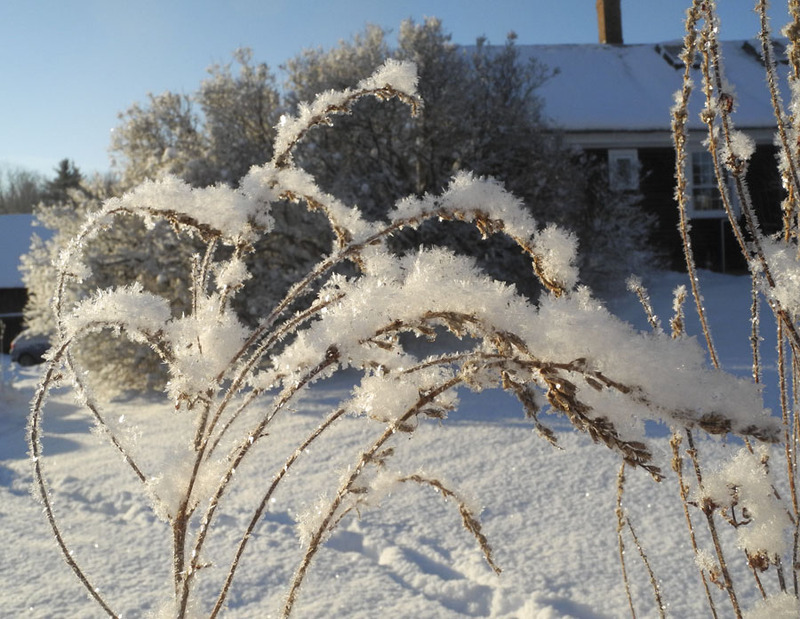 Ordinary weeds, festooned in sparkling white, are briefly among the most beautiful things on earth. 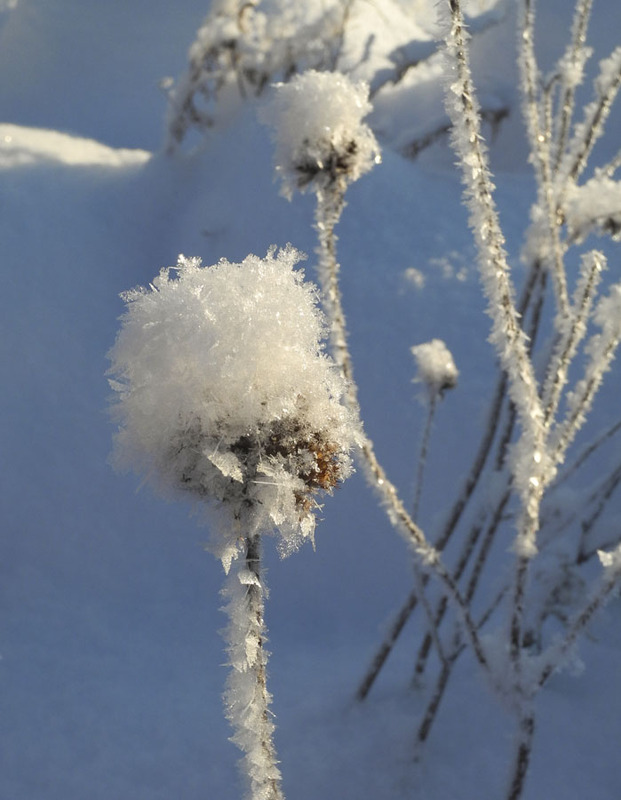 .....and the rounded seed heads of bee balm, topped with a tall white cap, join the weeds in celebrating this brief moment filled with crystalline light, the gift of an early winter. sd 17, egg tempera on hand-toned paper, ca. 7 x 7 in. 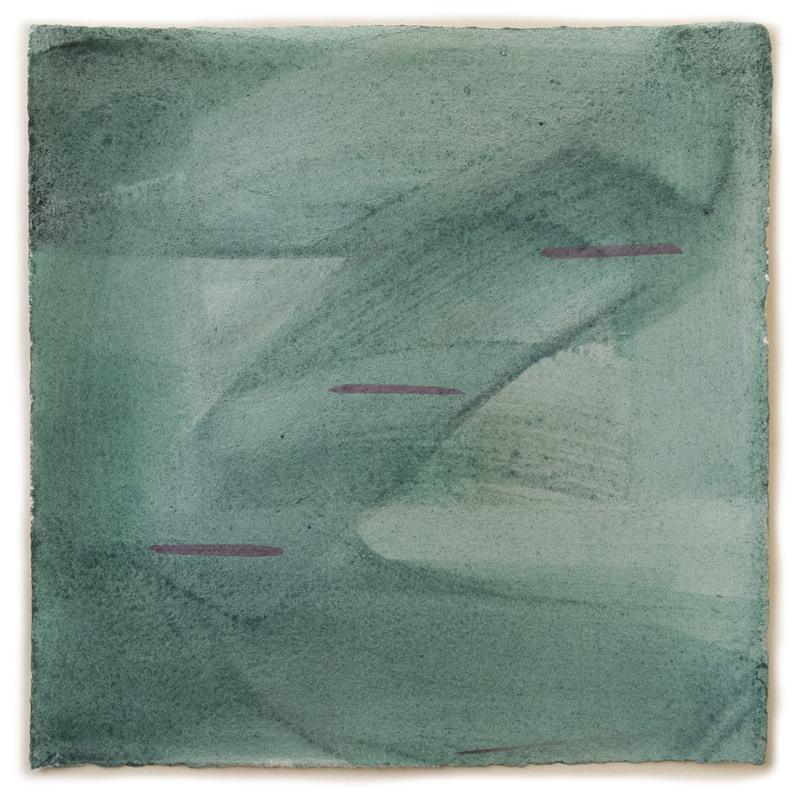 When I began this series of small drawings last spring, I toned the sheets of paper with a fairly solid wash of color (I use powdered pigment in a gelatin size for the toning; see this post for instructions). 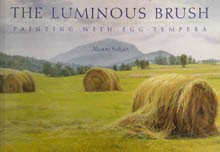 As I've continued with it, I've allowed my inner painterly painter to emerge: the gesture of brush laden with pigmented size has become as important as the small egg tempera shapes painted on top of it. sd 18, egg tempera on hand-toned paper, ca. 7 x 7 in. My sensibility tends toward the geometric, toward precision and control, so it's both fun and frightening to work on these: fun to do something new (though somewhat closer in feel in their improvisation to my potato prints), frightening to work on something new, where I don't have years of experience. sd 19, egg tempera on hand-toned paper, ca. 7 x 7 in. With my wide, 2 inch wash brush I laid down thin layers of reddish color, then added a heavier mark of more saturated pigment. 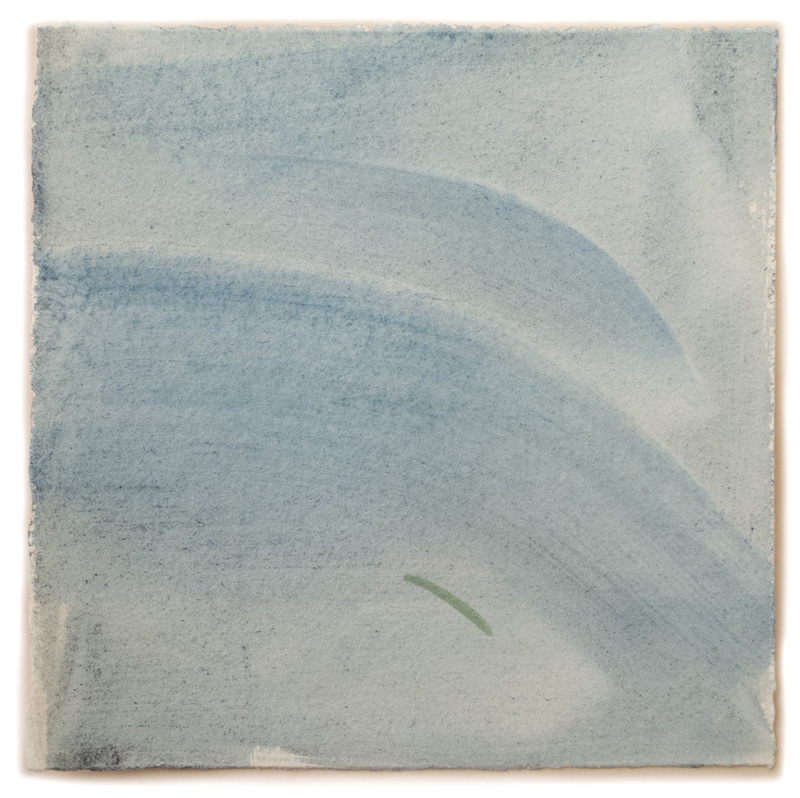 Later, I added the small square of blue egg tempera. sd 20, egg tempera on hand-toned paper, ca. 7 x 7 in. 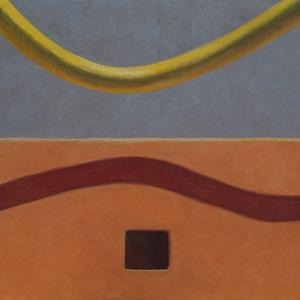 Geometry creeps in, with horizontal and vertical strokes framing looser ones; then the horizontal/vertical is emphasized with the addition of painted rectangles. 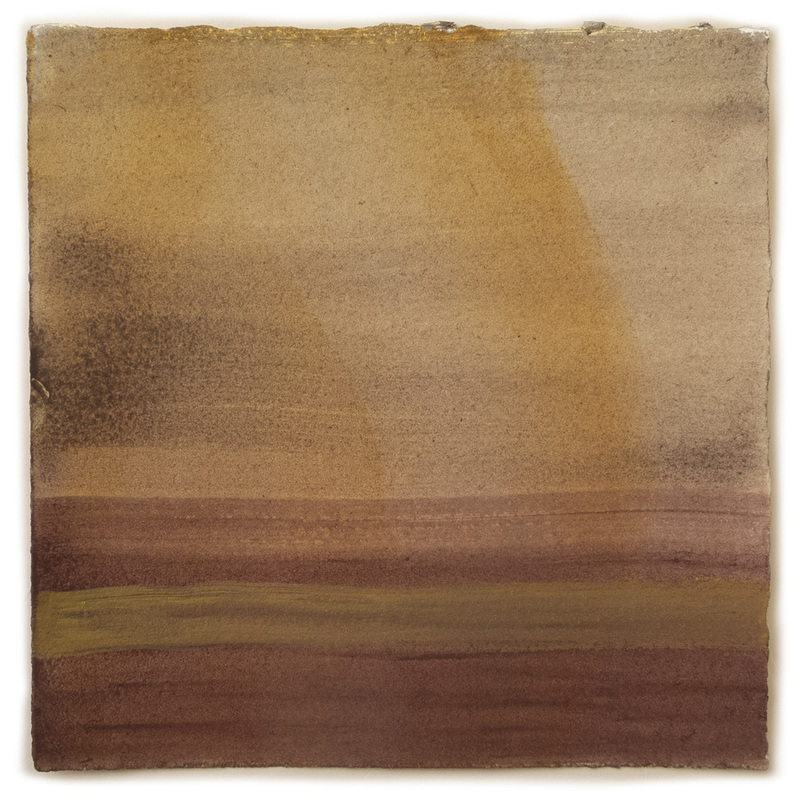 sd 21, egg tempera on hand-toned paper, ca. 7 x 7 in. sd 22, egg tempera on hand-toned paper, ca. 7 x 7 in. 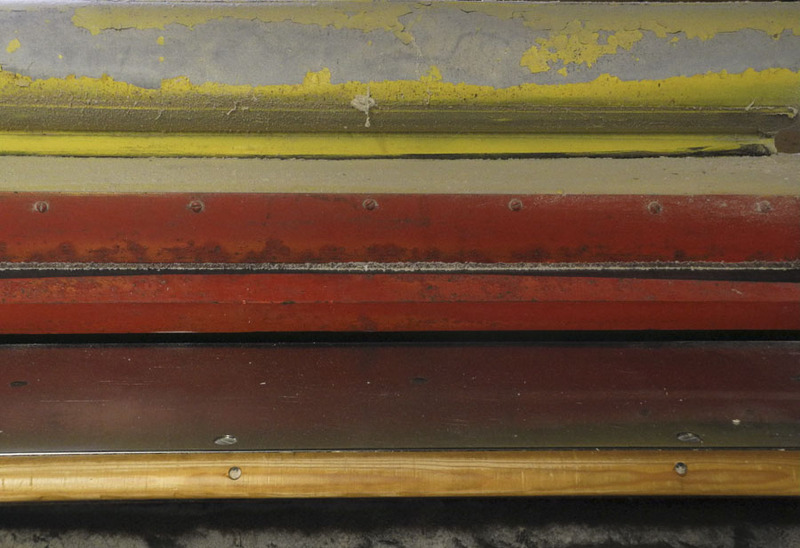 ....here an ochre band on top of the red at bottom. sd 23, egg tempera on hand-toned paper, ca. 7 x 7 in. And in this piece a very small green curve. sd 24, egg tempera on hand-toned paper, ca. 7 x 7 in. Finally, a green vertical dropping from a horizontal band. 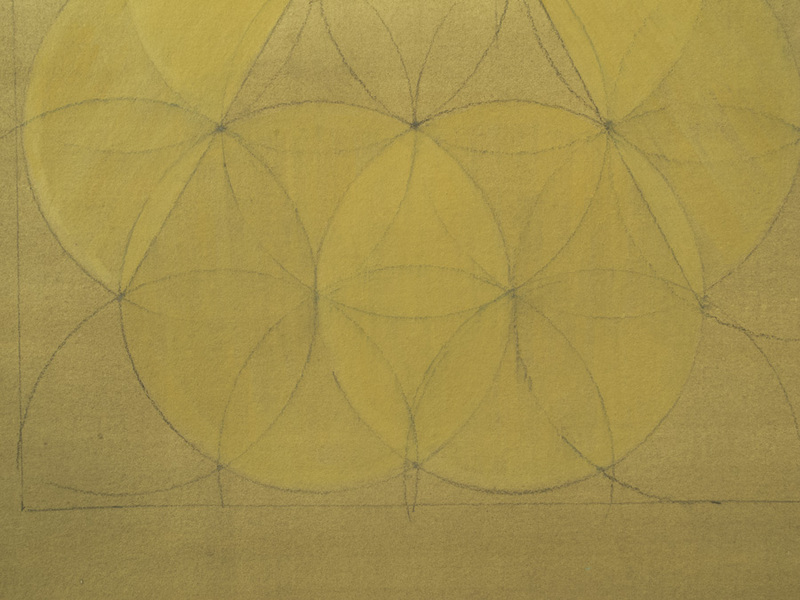 I might treat the drawing as complete without the addition of the egg tempera lines/shapes/brushstrokes, but there's something about the layering of another medium, and the thought and attention involved in choosing to make those marks, that makes the drawing richer and more solid for me. Cooking is often like alchemy: ordinary ingredients become magically transformed into heavenly tastes. 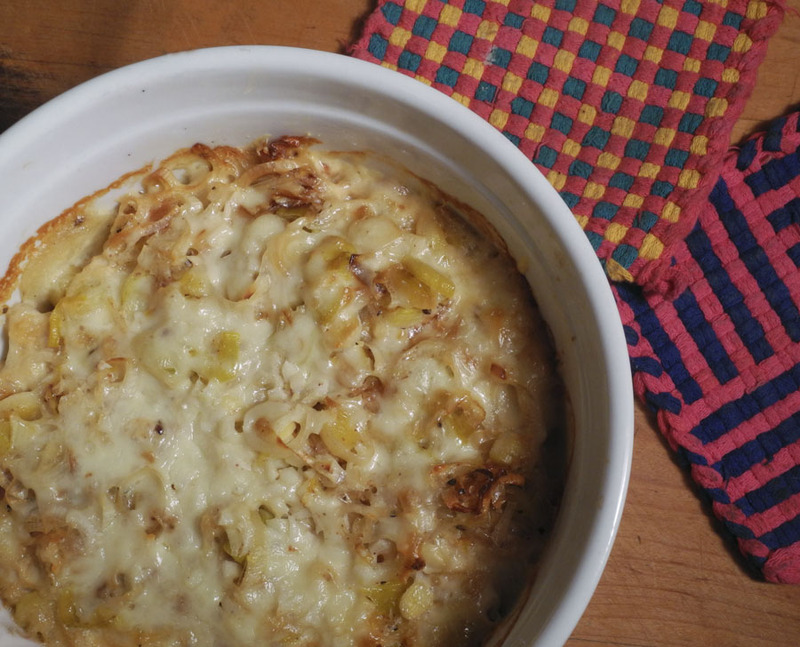 The first time I made this recipe, a Potato Leek Gratin from the New York Times, I thought it was so delicious that I ate nearly half of a recipe for 6 people. I had been searching for a recipe with potatoes and leeks, and couldn't have been more pleased with this one. I realize that I'm sharing it a little late for inclusion in Thanksgiving dinner, but it's not difficult to prepare and will work for a special or everyday dinner. 1.Preheat over to 350º. Butter a 2 quart gratin dish (I didn't have a large enough dish so used a souffle dish, which meant the potatoes were piled more thickly so got less crispy.) Wash leeks to remove any dirt and slice thinly. 2. 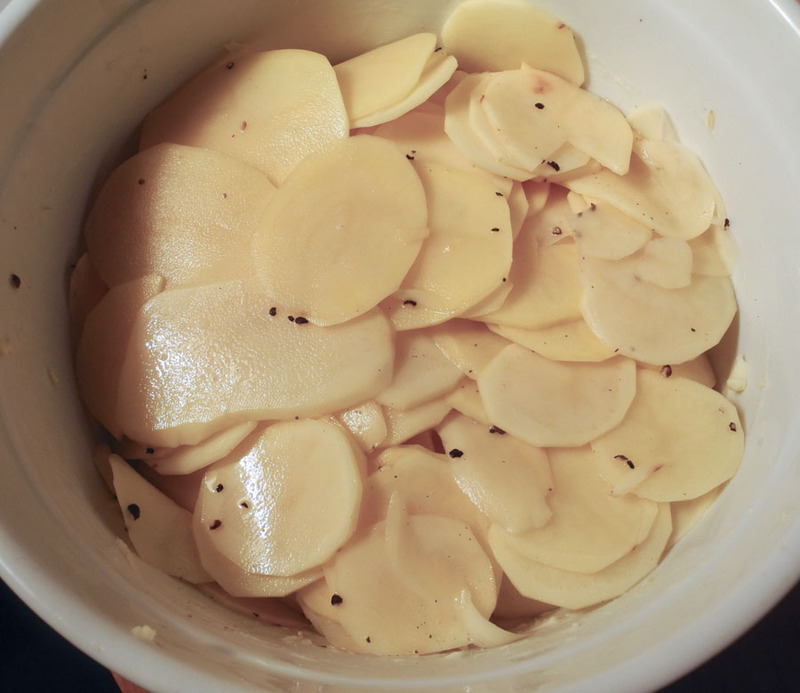 Using a sharp knife or mandoline (I used a very thin, 2mm, blade with my food processor, which made the slicing easy work) slice potatoes 1/8 inch thick. Toss them with 3/4 teas salt and 1/4 teas pepper. Layer the potatoes in a gratin dish. 3. Melt the 2 Tbs butter in a large skillet over medium heat. Add leeks, the rest of the salt and pepper, and the thyme. 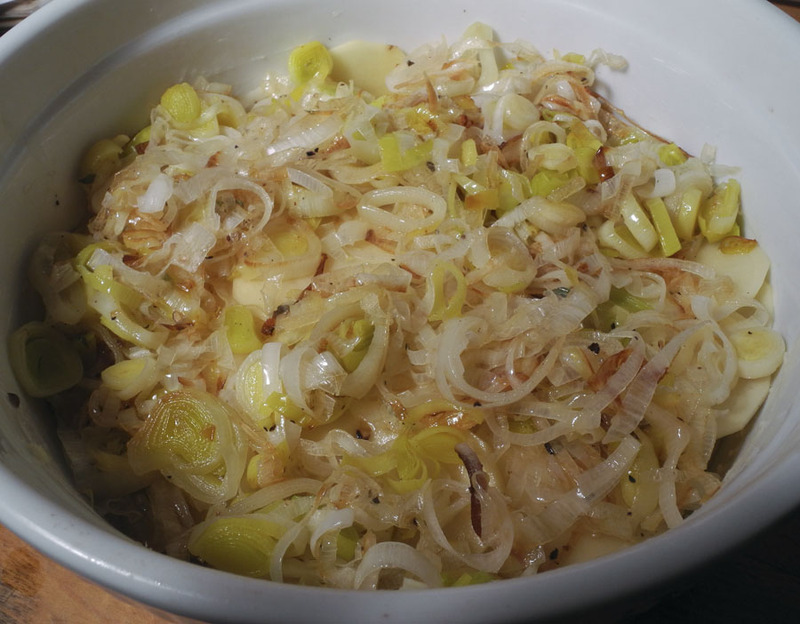 Cook, stirring, until the leeks are tender and golden, 5 to 7 minutes. Discard thyme and place leeks over the potatoes. 4. Add cream, garlic, and bay leaf to the skillet, scraping up any bits of leeks sticking to the pan. Simmer gently 5 minutes, stir in nutmeg. 5. Pour the cream over the leeks and potatoes. (there's nothing in the recipe to suggest removing the bay leaf, but I remove it.) Top with the cheese. Cover with aluminum foil and bake for 40 minutes. Remove the foil and bake for an additional 15 -20 minutes, until the cheese is bubbly and golden. Cool a bit before serving. I hope you all have a wonderful Thanksgiving holiday. Although there's much that's wrong with the world today, I know that I have so much to be thankful for, and I hope that you do too. 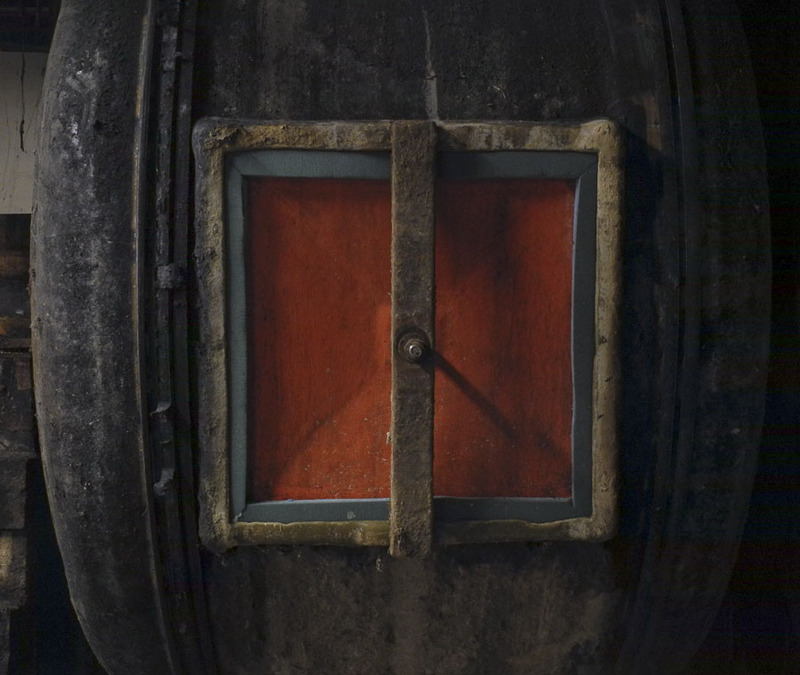 ...and the brilliant red bounded by blue of the door on this large drum, used for soaking and dyeing. Though not strictly a machine, I include this angled table because I find its form so appealing and simple. 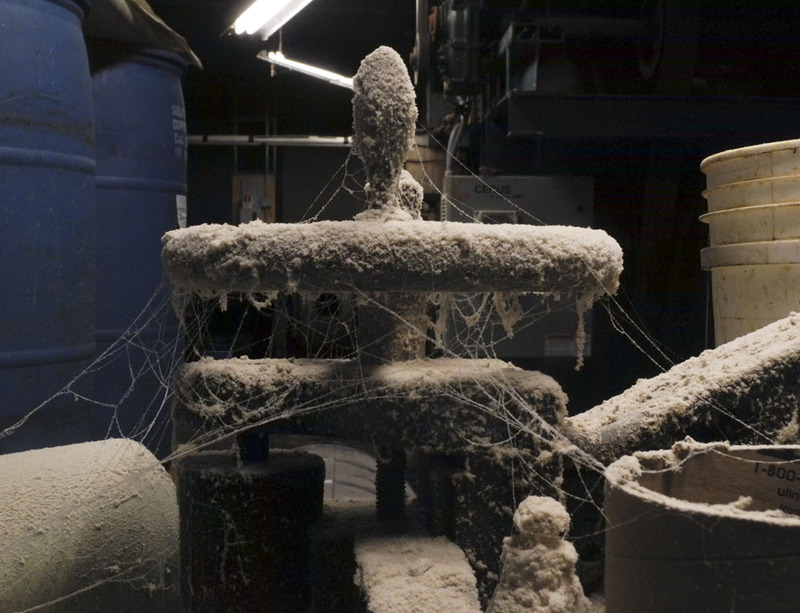 On this machine, a sander, it's the very low-tec crisscrossing string that animates it. 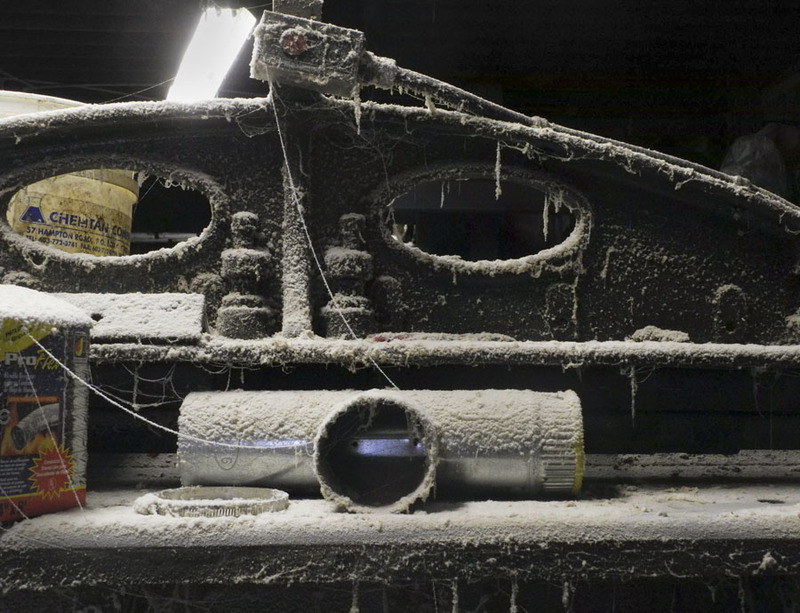 Of course there are times when we see faces in inanimate objects. 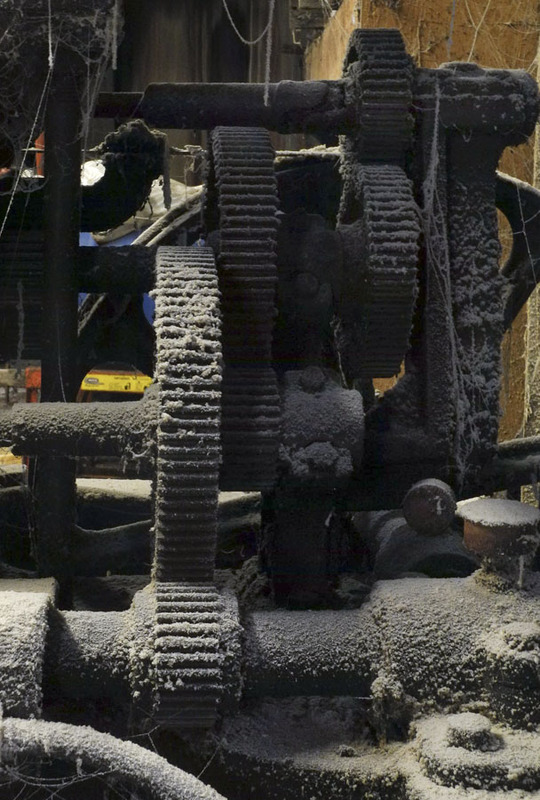 And how beautifully effective are the teeth of gears! effective aesthetically while being functional. 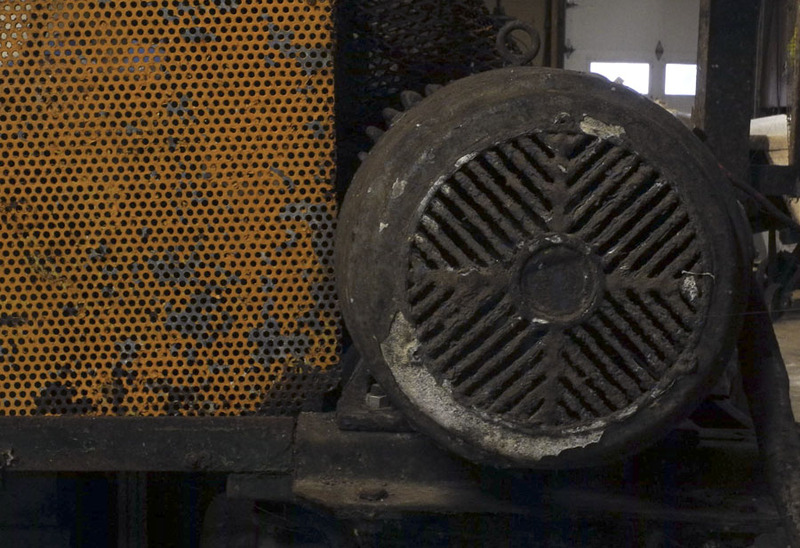 The festooning of cobwebs and dust add nostalgia to the clean forms of handle, standing erect, and wheels. 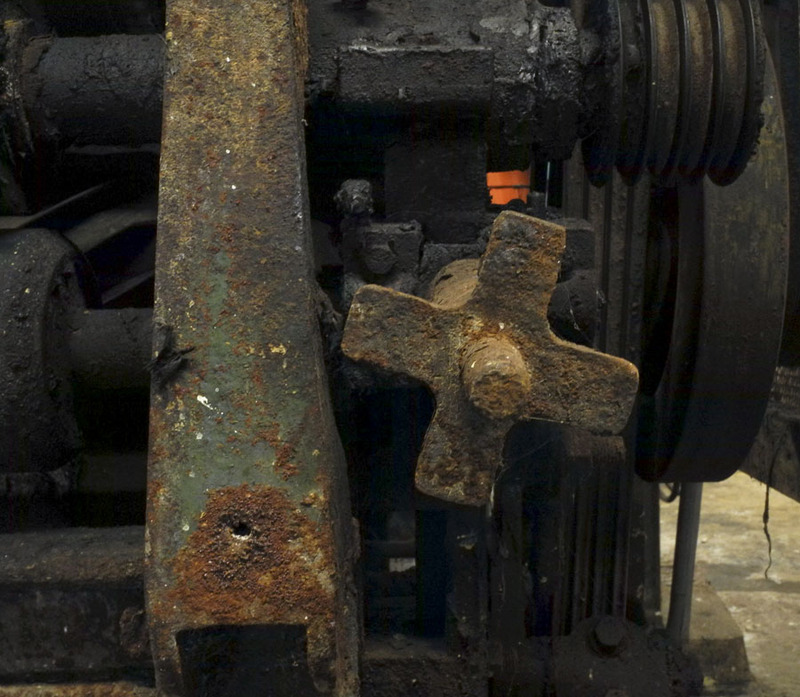 I don't know if the cross-shaped piece is a handle, but whatever it is, I like its juxtaposition with the long bar alongside it, both in color and form. Here is another rich pairing, of an orange plate with pierced holes and a flattened cylinder with angled lines. 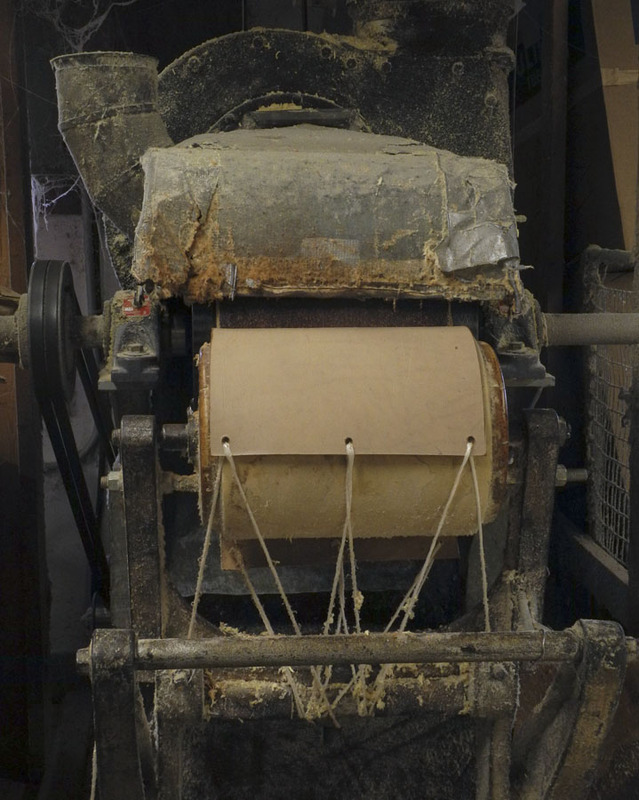 These last two photos are of the side and back views of a single old machine, one used to measure the size of pieces of parchment and leather. 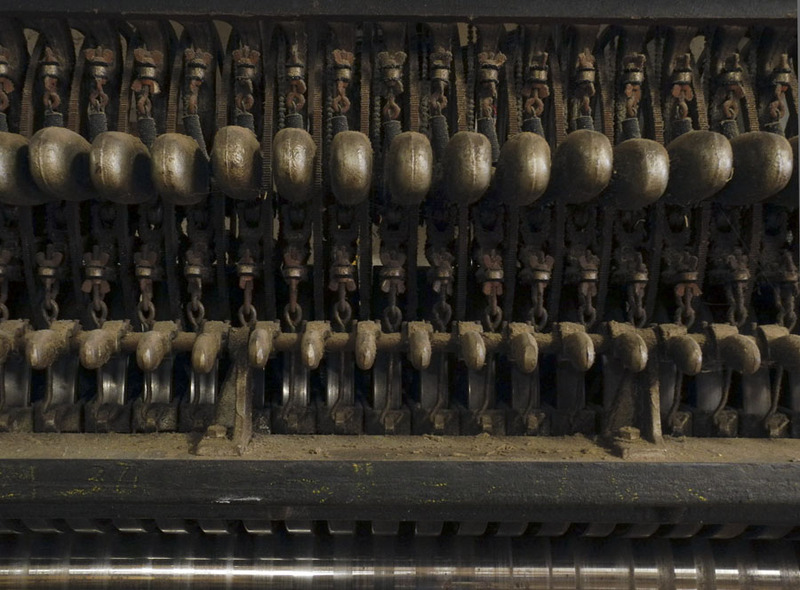 What a marvel that someone developed a tool such as this and how wonderful in the rhythms of its complexity. 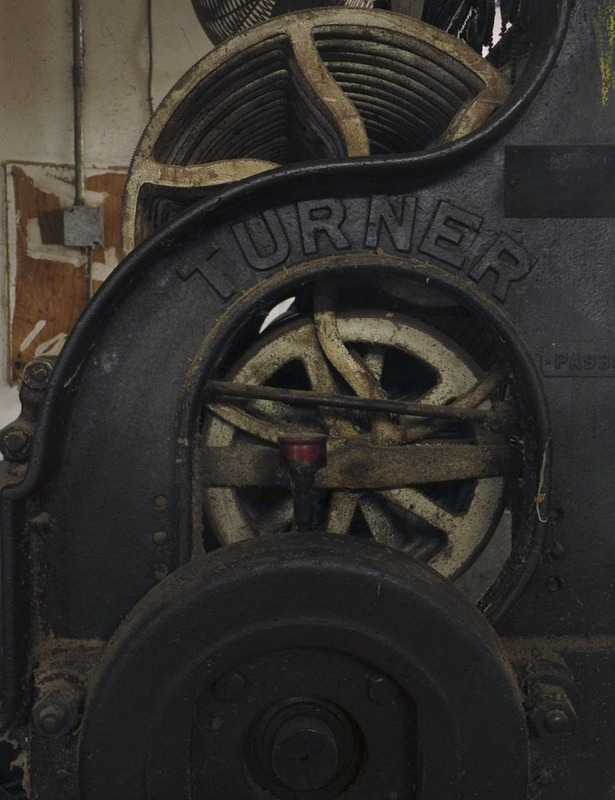 I'm not alone in finding machines inspirational; a couple of weeks ago I did a post on "Machines in Art". I could never invent the variety of compositions and forms that I find in them. 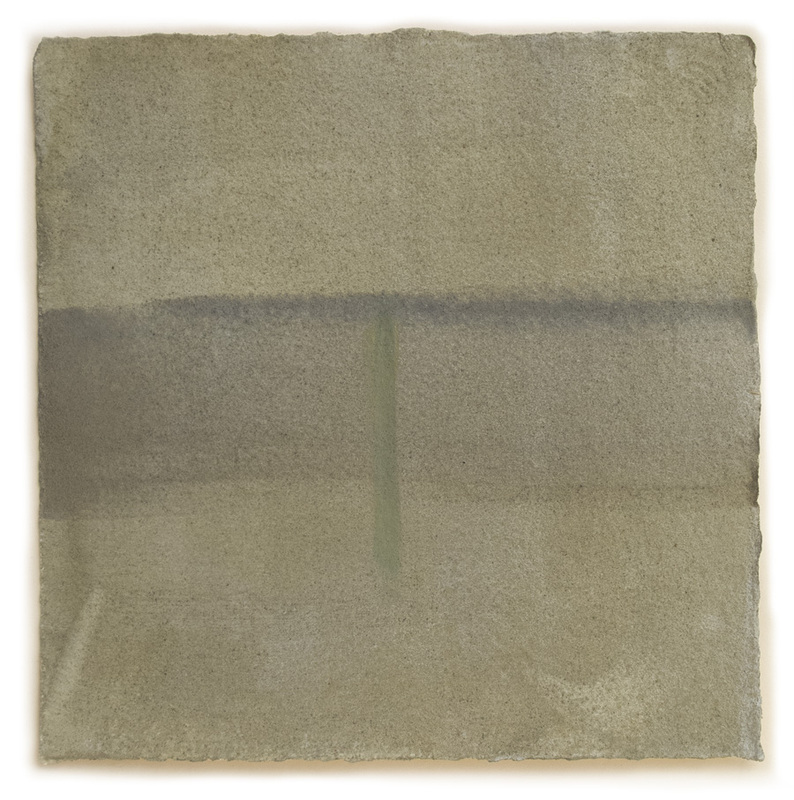 #41, egg tempera and graphite on hand-toned paper, 15 x 15 in. 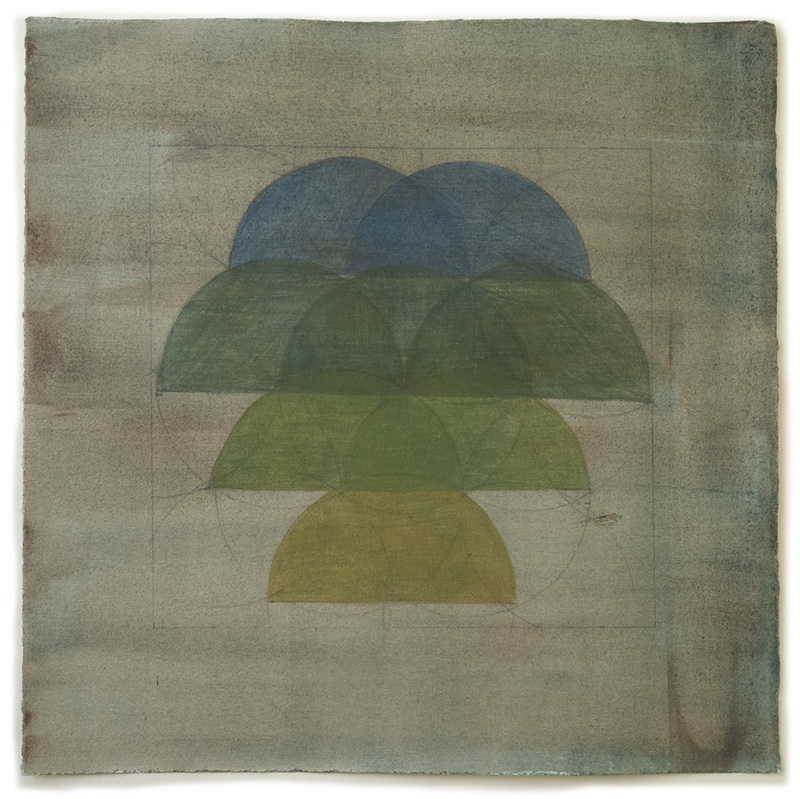 When I began this group of drawings, I was thinking of the subtleties of James Bishop's paintings, which I wrote about here; it would be an interesting challenge to myself to try to work in a restrained range of color. 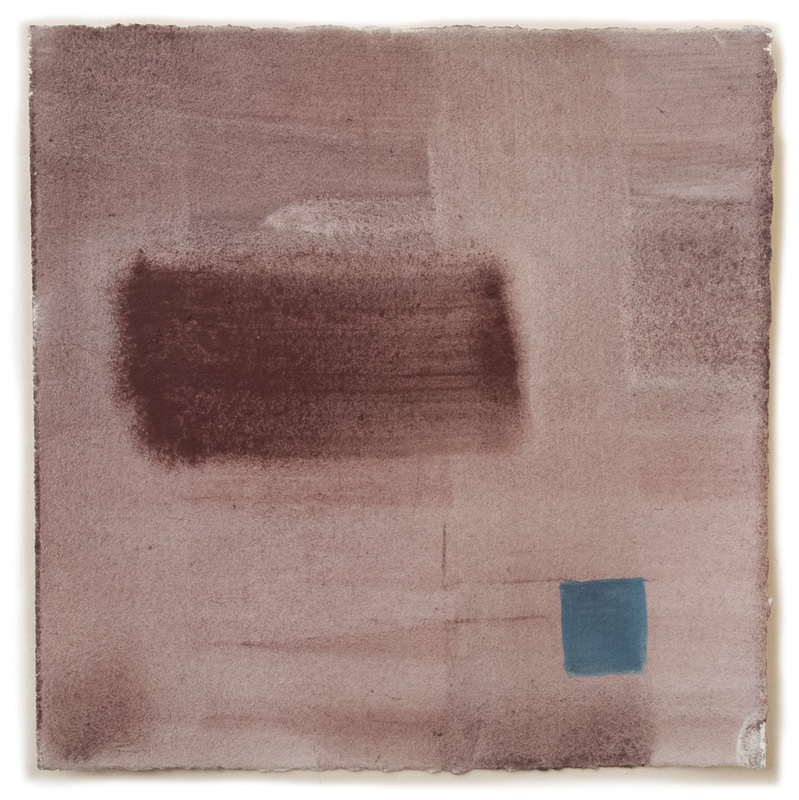 I began by toning this paper with layers of phthalo blue and a burnt sienna; the visual mix was a varied gray. I moved from blue to yellow in the semi-circular shapes; they are not pure hues, but are mixed with color opposites to gray them. 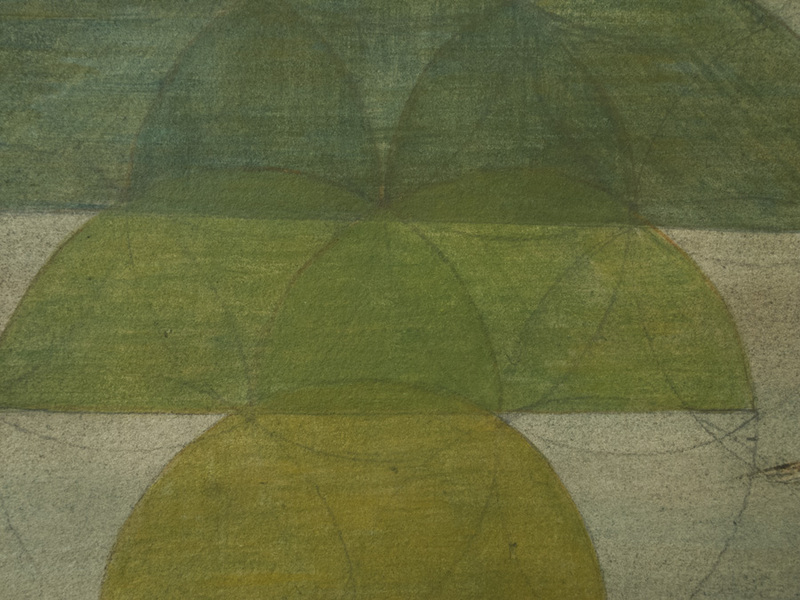 In this detail you can see how the overlapping shapes create new darker shapes between them. It's always interesting to see what will appear during the process of the drawing. 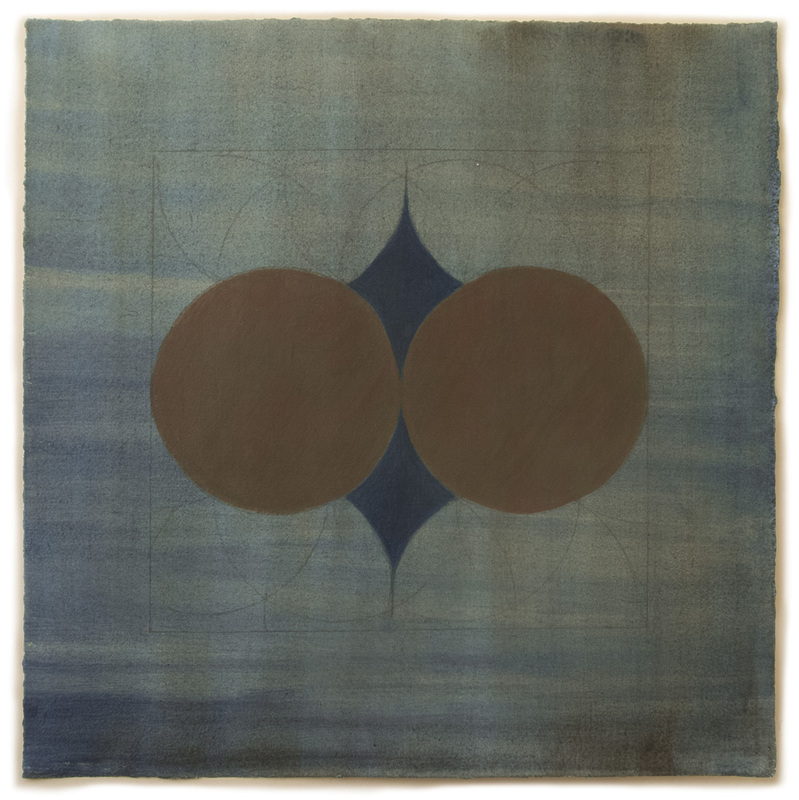 #42, egg tempera and graphite on hand-toned paper, 15 x 15 in. This is the most subtle of the drawings with yellow on yellow. I had to restrain myself from putting more layers of paint on the shapes; I wanted the drawing to be hardly there. 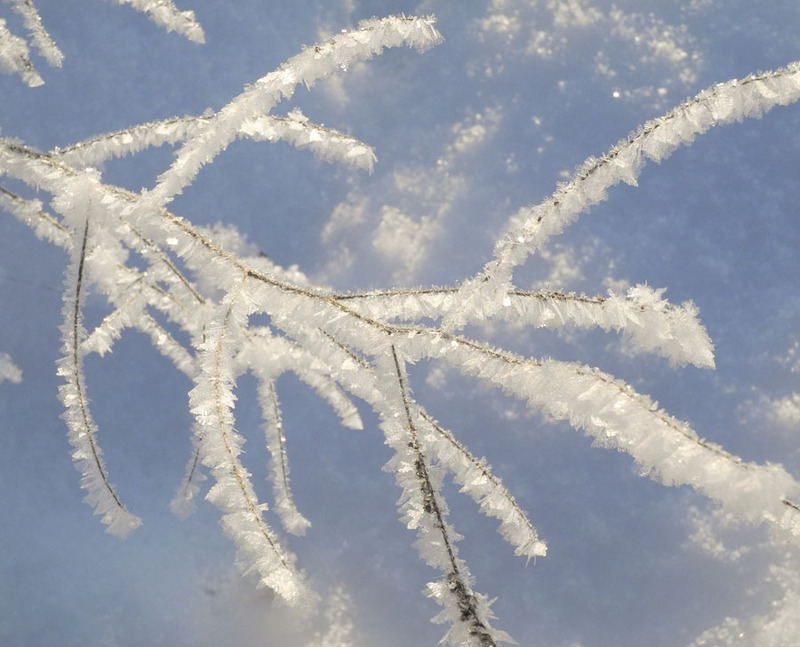 The translucency allows for new shapes to come forward where shapes overlap. 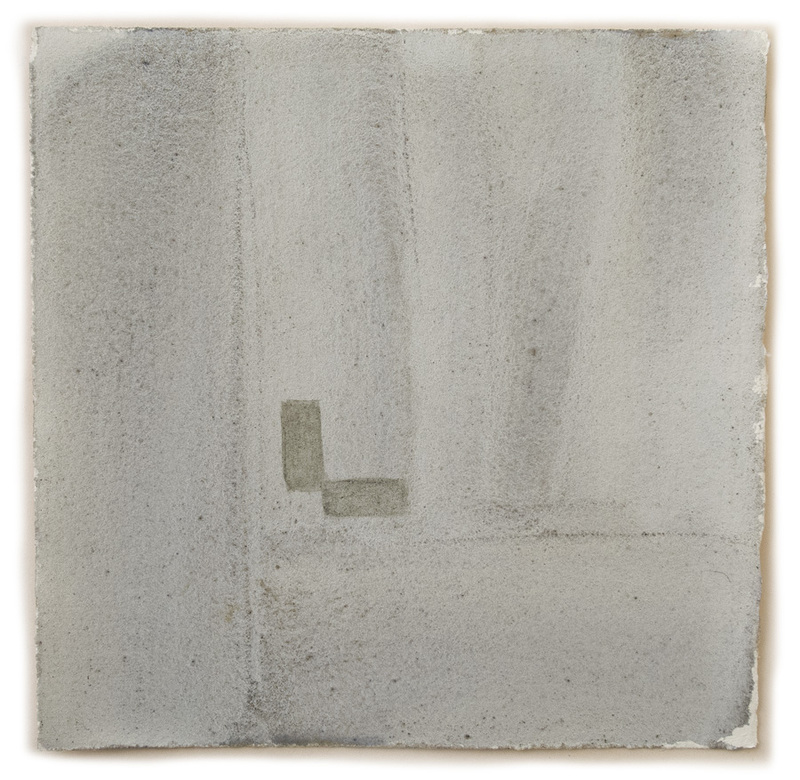 #43, egg tempera and graphite on hand-toned paper, 15 x 15 in. The "maybe three" refers to this drawing. I had tossed it aside, feeling very uncomfortable with those big circles which had too many allusions, but then just as I was about to tear it up a few days after making it, I stopped: hmmm....maybe it's not so awful. You can put in your two cents about it, whether like or dislike; I'd be interested to know. 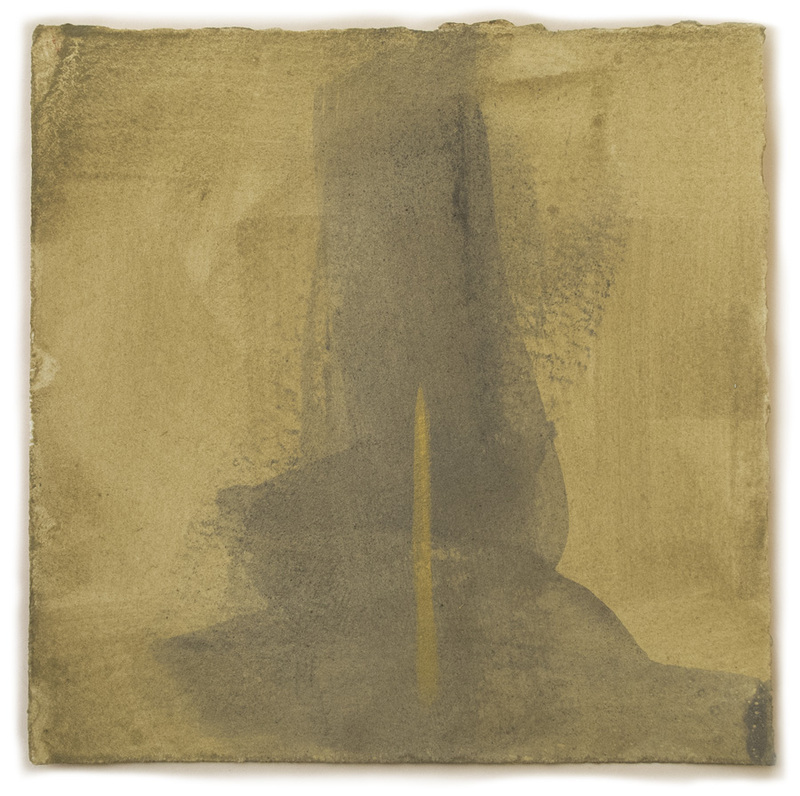 #44, egg tempera and graphite on hand-toned paper, 15 x 15 in. James Bishop said in an interview, to explain why he began to work solely on paper, "you surprise yourself more often on paper". That was very true with this drawing. 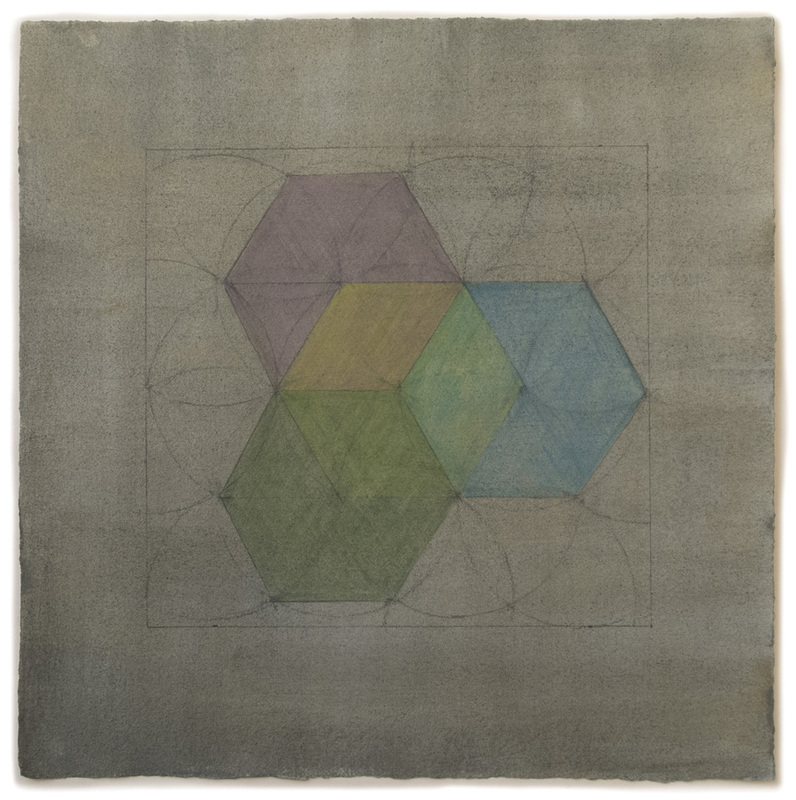 In the study for this work, I had three adjacent hexagons, and one overlapping in the center. 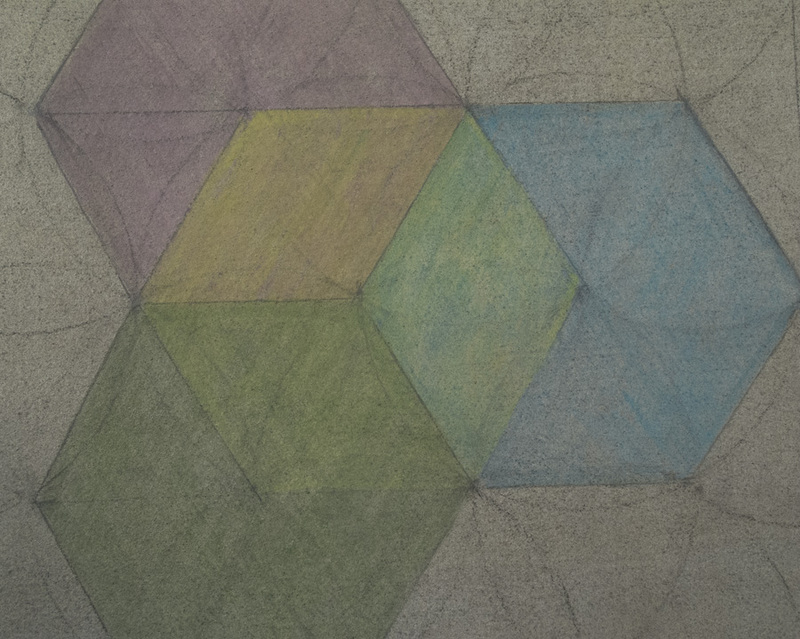 I began with violet, blue, and green hexagons, then painted a yellow hexagon over them for the center shape. What appeared was not at all what I had expected: it was an illusionistic cube. 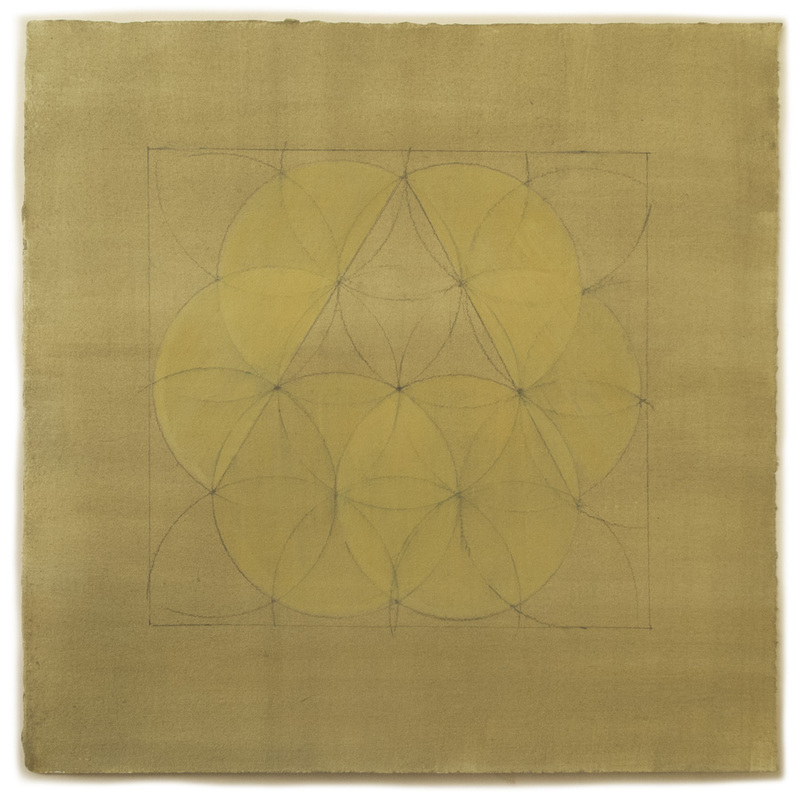 When I saw this I realized that this sacred pattern is the template for tile work of three dimensional cubes extending outward; traditional quilts use a similar pattern, although the template is different. It's fascinating that some patterns appear in different cultures separated by time and distance, as though they were hardwired into human consciousness. Noh Costume (Nuihaku) with Scattered Crests; Japan, Edo period, second half of 18-19th century; silk embroidery and gold leaf on silk satin; overall 65 x 53 1/2 in. Image courtesy Metropolitan Museum of Art. Each time I see a show of Japanese art and objects I am more convinced that the culture had a genius for design; whether in prints, or with the Rinpa aesthetic, or paintings of birds, there is an unerring use of shape and line to animate a surface; it is no wonder that Japanese art was so influential in early Western modernism. 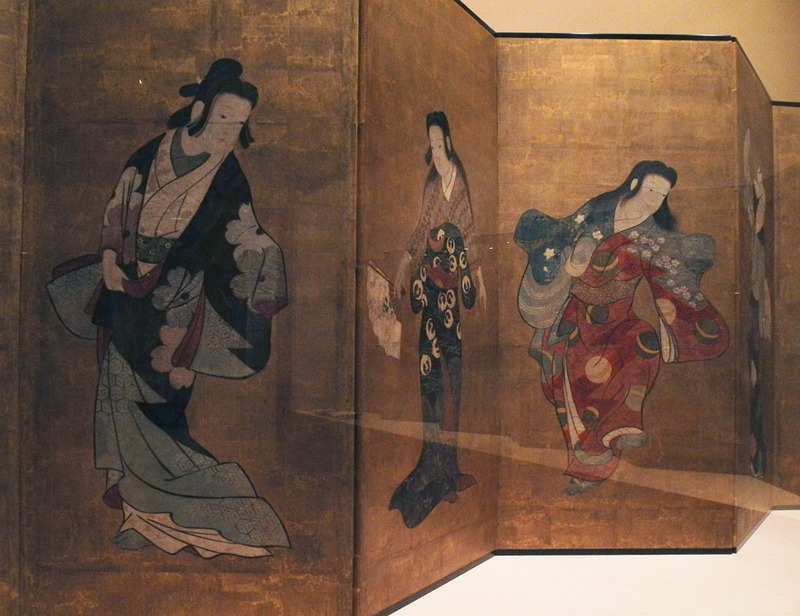 The latest treasures are to be found in an exhibition at the Metropolitan Museum of Art: "Kimono: A Modern History". Robes from the late 18th century up until the 20th century are included, with accompanying objects, all of which can be seen at the link. 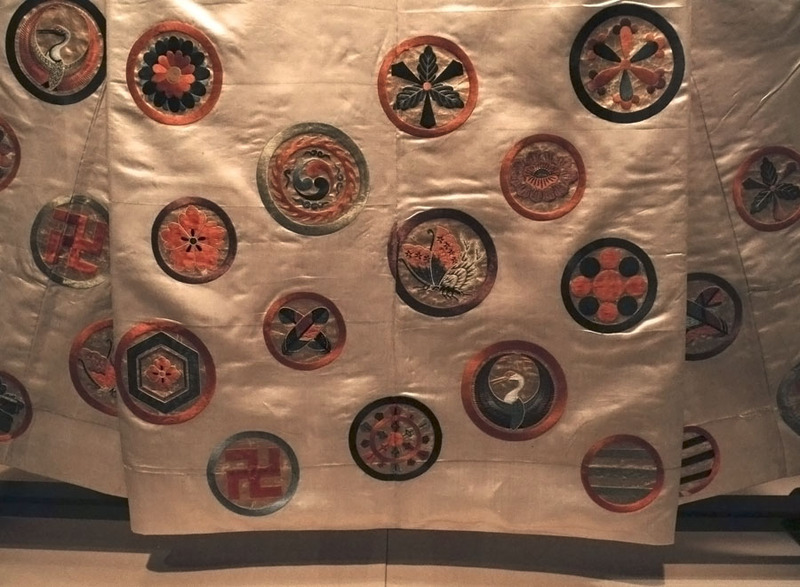 The circular crests, some of which have Buddhist meanings, seem to be spinning across the white glistening silk of the Noh costume. I was very naughty the day I was at the Met; there were so many very beautiful objects that we weren't supposed to photograph, but my eye itched to capture them, so I snuck photos in this and in another show. The photos of professional photographers are too often flooded with light, flattening the objects (and even paintings) and bleaching them of life. So, this photo that I took gives a better sense of the physical presence of the design of the kimono. 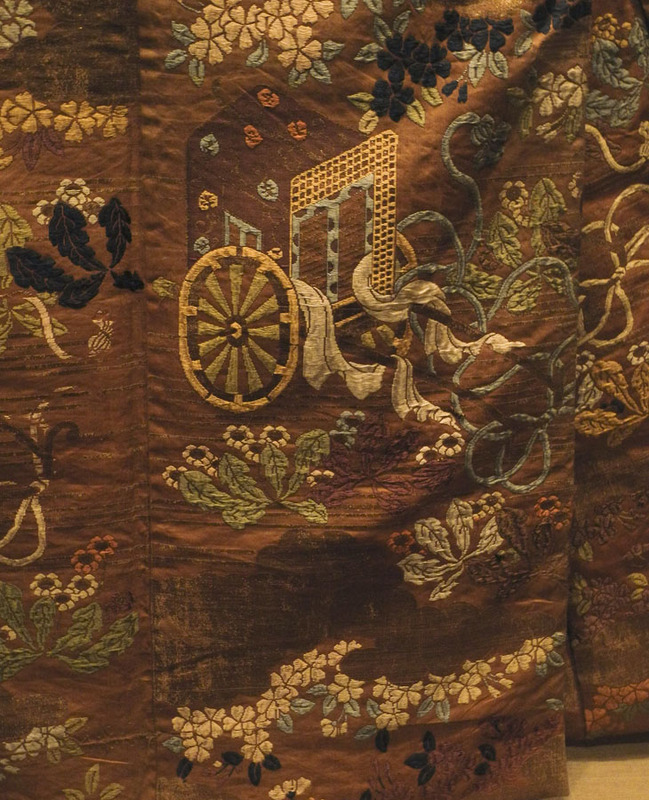 detail, Noh Costume (Karaori) with Court Carriages and Cherry Blossoms; Japan, first half 19th century; twill-weave silk brocade with supplementary-weft patterning in metallic thread. See the entire garment here. This is another richly embroidered kimono with a complex pattern, a complete delight to wander through. I love the varied approaches to the materials in this robe. 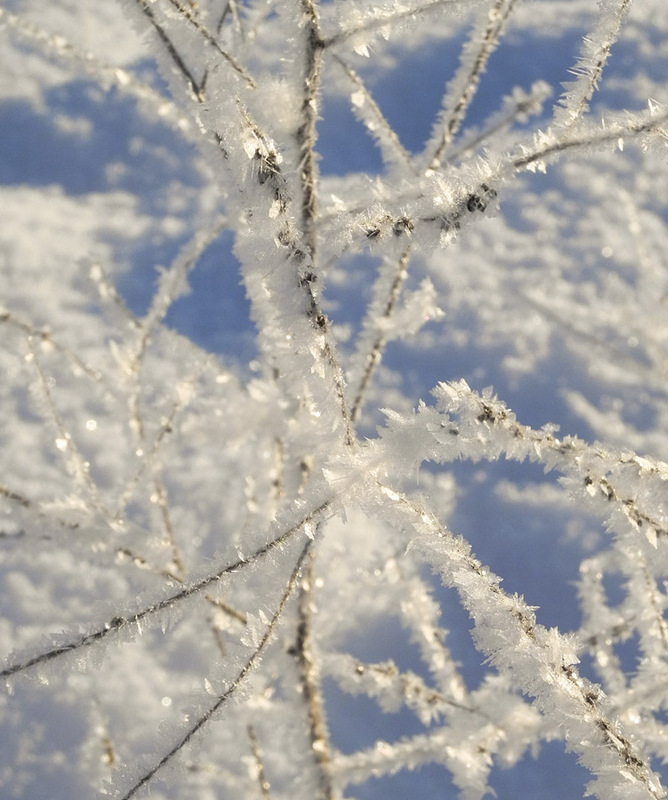 The whitish line of a tree and its leaves are made with tie-dyeing; the other elements are embroidered. It is incredibly beautiful. Outer Robe (Uchikake) with Mandarin Oranges and Folded-Paper Butterflies; Japan, late 18th-early 19th century; tie-dyed satin damask with silk embroidery and couched gold thread; overall 69 1/2 x 48 1/2 in. Image courtesy Metropolitan Museum of Art. 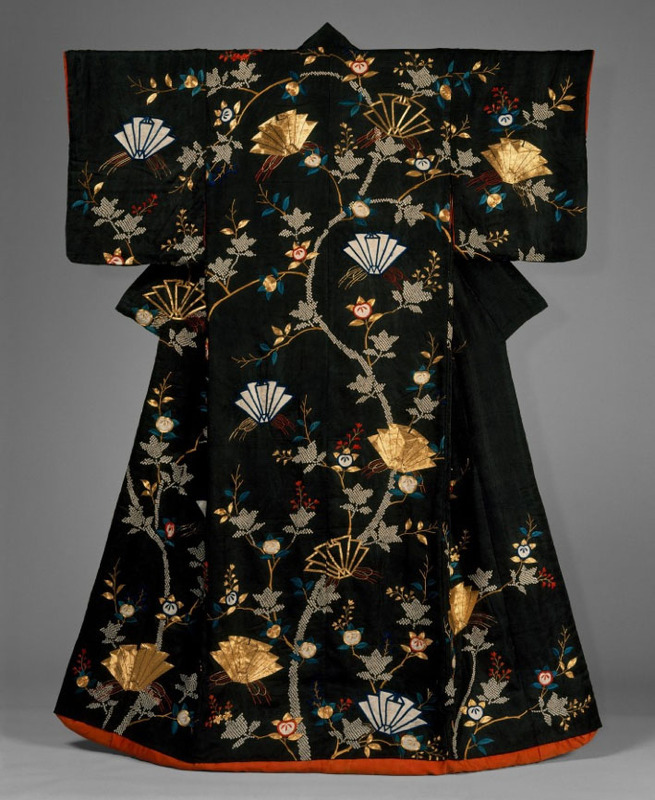 Of course a robe like this was for an elite person, a high-ranking samurai woman. An outer robe such as this was worn for a traditional wedding: the folded male and female butterflies symbolizing the wedded couple, and a long and happy marriage. 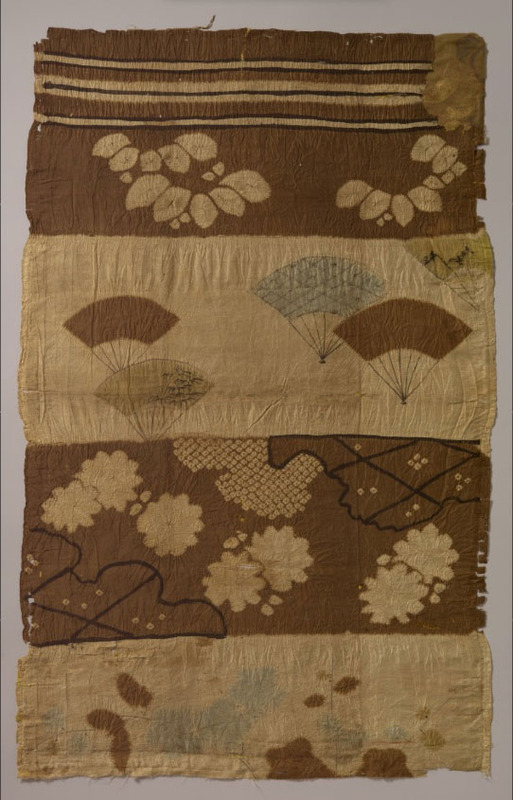 Tsujigahana Textile with Horizontal Stripes, Flowering Plants, Fans, Snowflakes, Clouds, and Bellflowers; Japan, Momoyama period (1573-1615; plain weave silk with resist dyeing and ink painting; 24 3/16 x 15 1/2 in. There are lovely design variations in the horizontal bands of this textile. 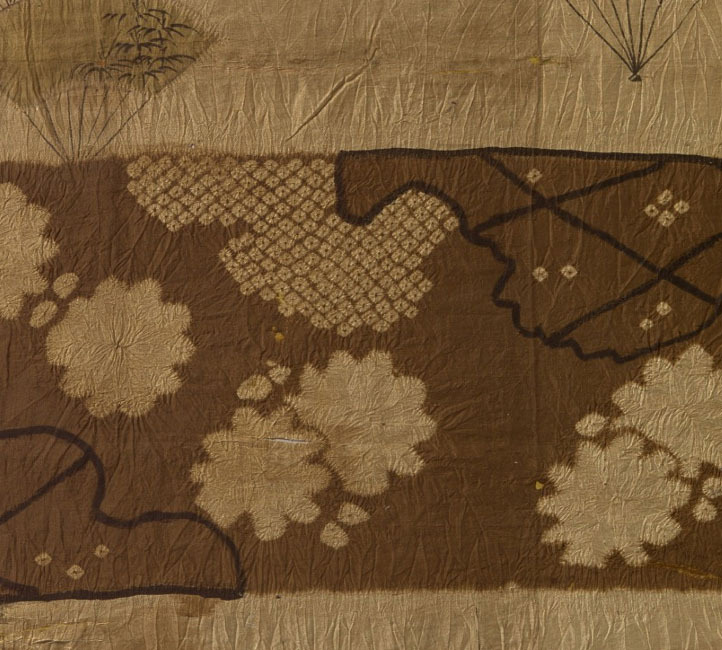 In the detail, which I downloaded from the enlargement at the Met's website, you can see (click to enlarge) how some of the patterns were made by resist dyeing, such as the small squares with the dark central dot which also appear in the Outer Robe above. Dancers; Japan, Edo period, late 17th-early 18th century; six panel folding screen; ink, color, and gold on paper; 50 3/16 x 136 5/16 in. The graceful movements of dancers in their elegantly patterned robes float on a golden ground. Farmer's Jacket; Japan, second quarter of 20th century; plain-weave cotton, silk, and mountain wisteria fiber (yamafuji); 47 1/2 x 51 in. Not all the garments in the show were for high ranking individuals. There were several dramatic firemen's jackets and this lovely, restrained farmer's jacket, woven from scraps of used textiles. 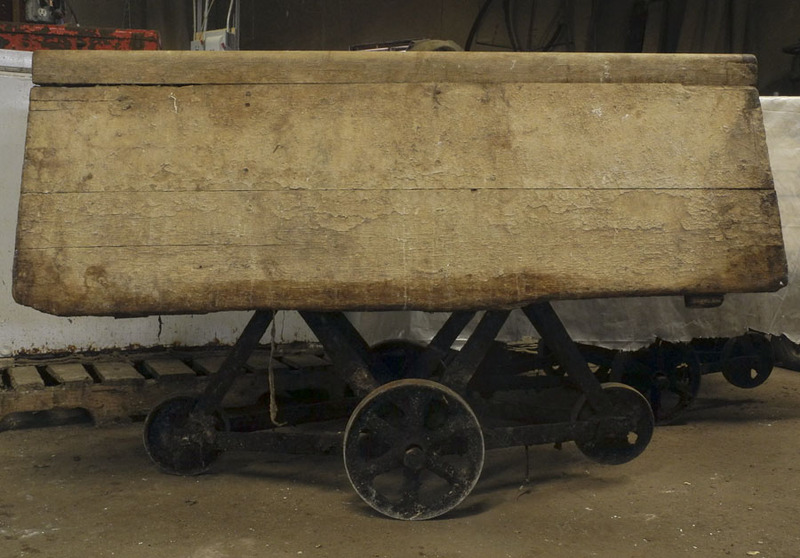 It is believed to have belonged to a successful farmer and was likely never worn. Kosode Pattern Book, vol. 1; Japan, 1667; ink and color on paper, 7 x 5 in. Images courtesy of Metropolitan Museum of Art. 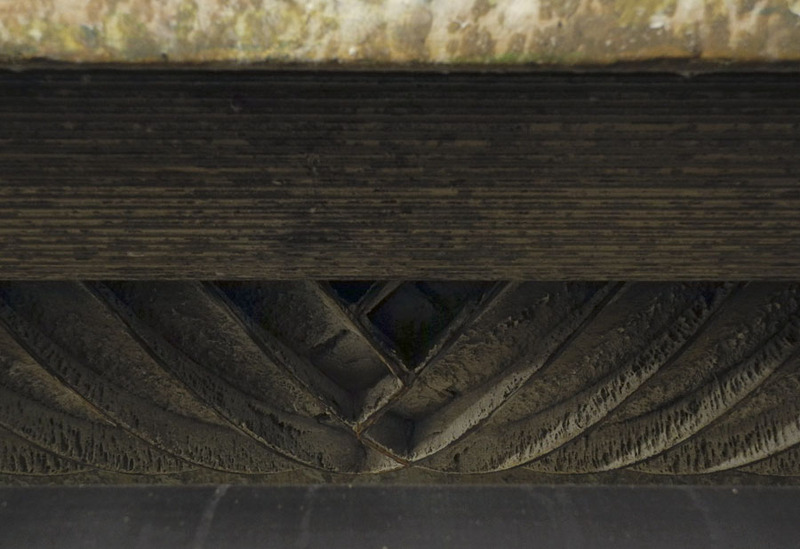 I loved seeing these old patterns with their very dynamic designs. There are 12 double pages at the link above, all creating a sweeping movement across the surface of the kosode, or robe. 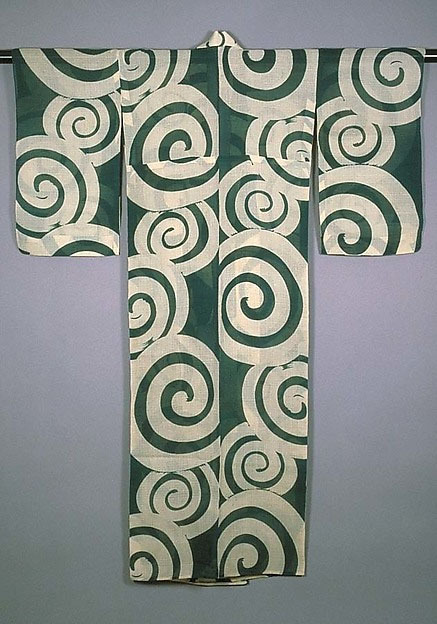 Unlined Summer Kimono (Hito-e) with Swirls; Japan, ca. 1920-30; crepe silk gauze, 60 13/16. When we come to the kimono of the 20th century the designs become bolder and more abstract, very much influenced by the art and design of the times, including Western art. The green and white swirls of this piece are dizzying and quite thrilling. Meisen Kimono with Geometric Patterns; Japan, 1920s; plain-weave raw silk, stencil-dyed warps and wefts; 57 1/2 x 47 3/16in. 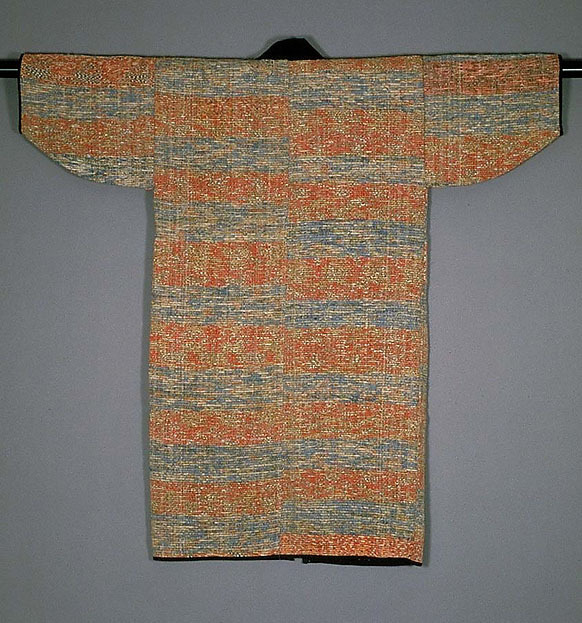 Unlined Meisen Summer Kimono with Cracked-Ice Pattern; Japan, 2nd quarter of 20th century; plain-weave raw silk, stencil-dyed warps; 55 1/2 x 50 in. 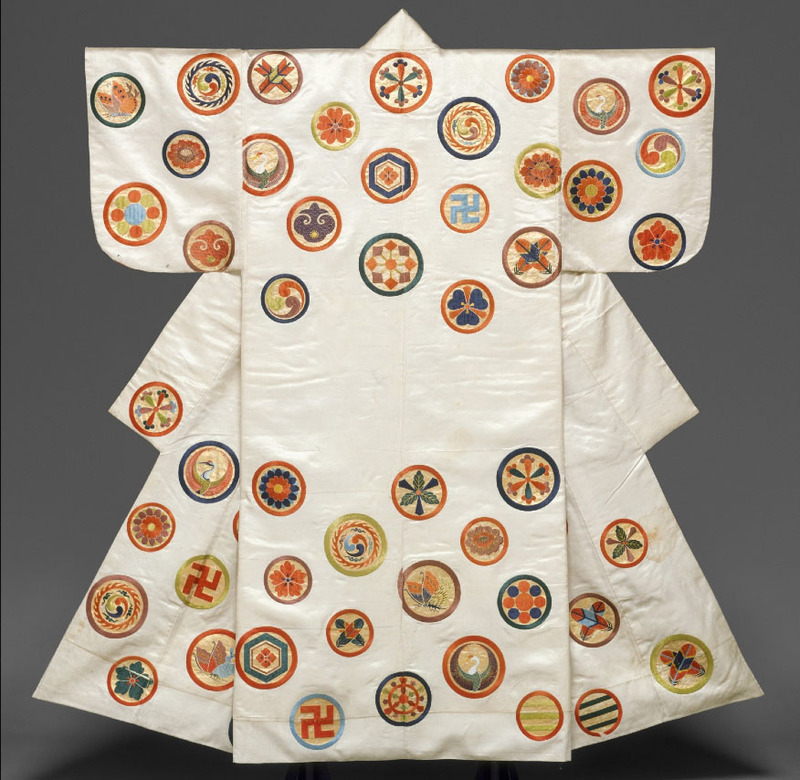 The Met's website wasn't very helpful as to what Meisen kimono were, so a little research turned up the fact that the meisen textile is woven of second grade silk threads in the Kanto region. 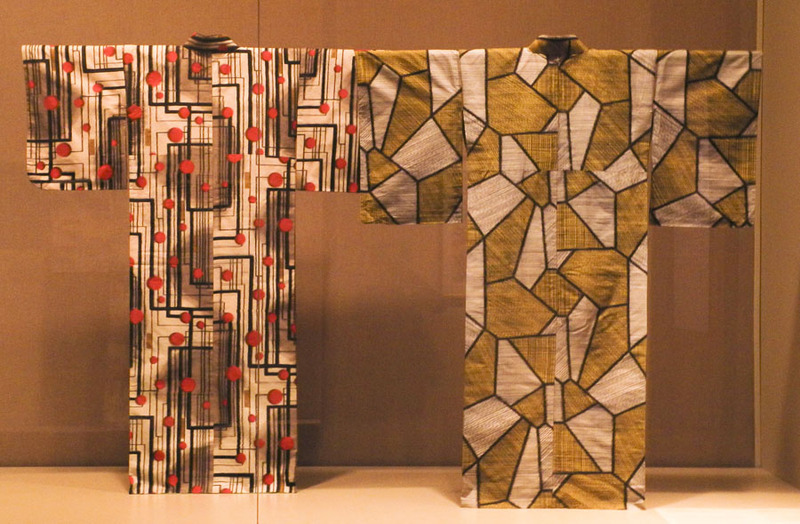 They were kimono that had modern all-over designs and were available to ordinary people: they weren't made to order but were sold off the rack in Japan's new department stores and were very popular with young women. 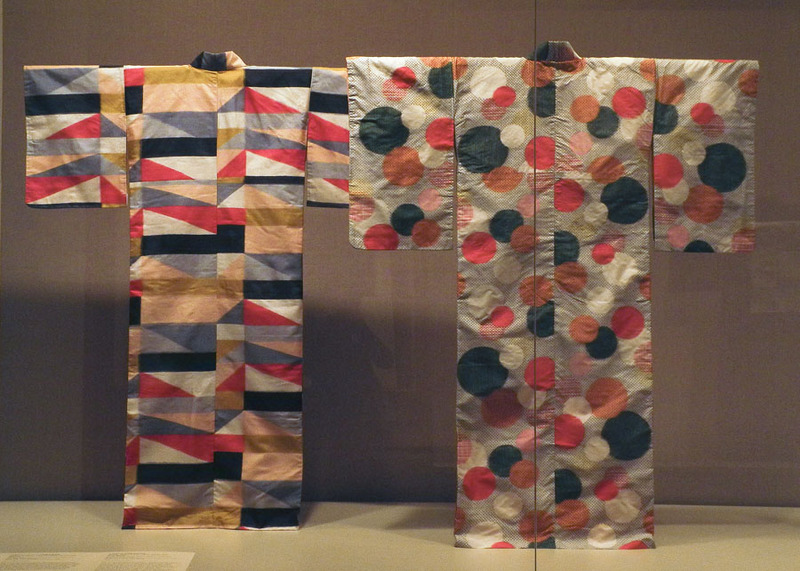 Chichibu Meisen Kimono with Multicolor Checks; Japan, 2nd quarter of 20th century; silk ikat; 59 1/16 x 49 3/16. Meisen Kimono with Overlapping Circular Patterns; Japan, first half of 20th century; raw silk, stencil dyed warps and wefts, 59 x 49 1/4 in. These kimono are so wacky and wonderful, with their exuberant color and design. They were made up until the mid 1950s, when Westernized clothing took over. 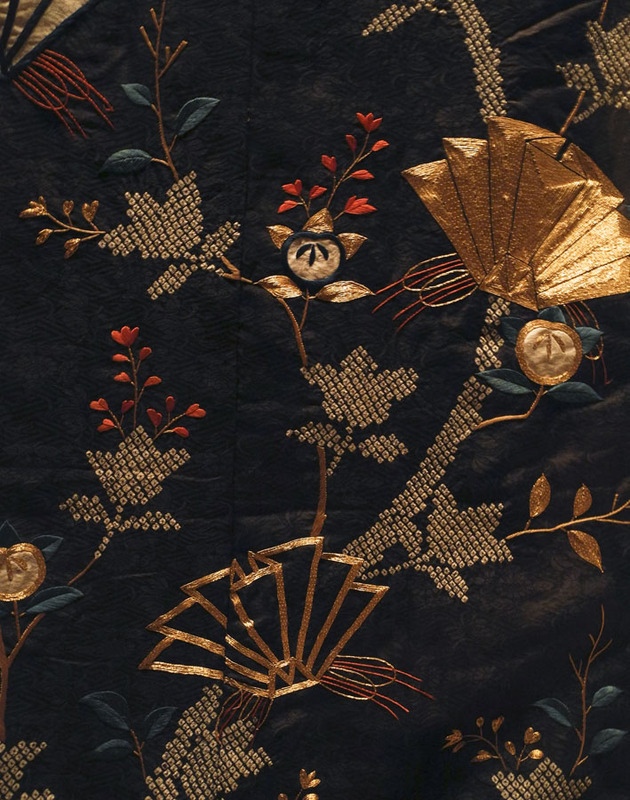 From the highly specialized and individualized kimono of earlier times, garments that spoke of the wearer's status, to more open and modern ones, all were beautiful, and all induced a feeling of longing; longing for beauty in items of everyday life. 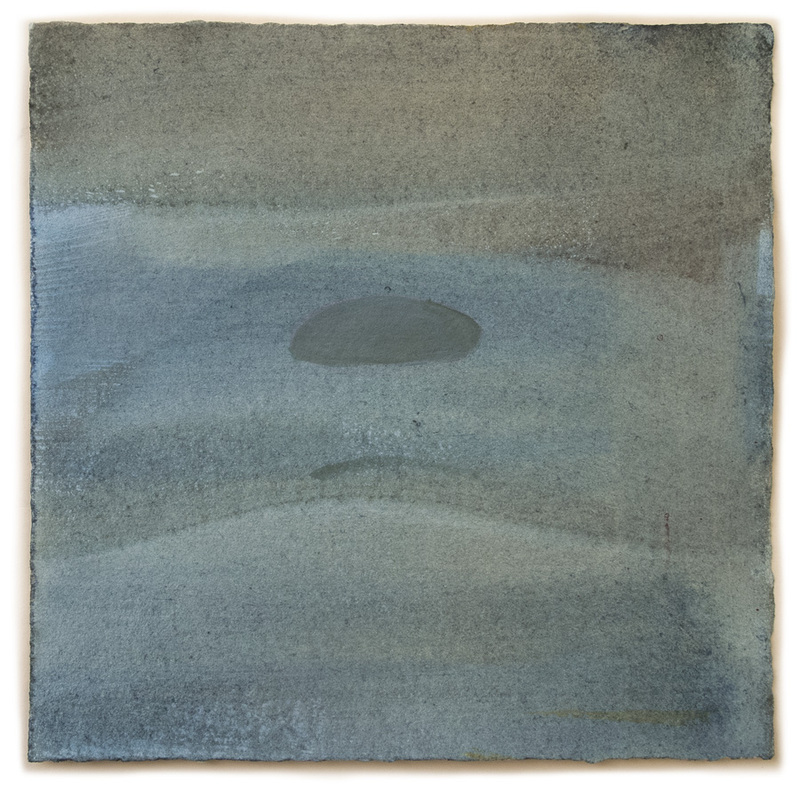 A New Painting: "Circles, Light and Dark"